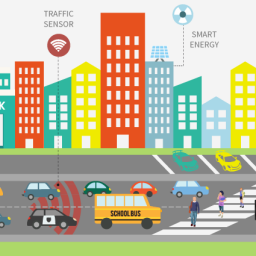 Three ways in which IoT can make Cities Smart – Kirti Telnet Pvt. Ltd.
With the breathtaking advancement in technology in urban areas, and rural areas lagging behind, the exodus from rural to urban areas has never been so pronounced. One of the latest and greatest technological advancement that is taking place is the Internet of Things (IoT). In layman’s language, everything in urban homes or cities is “smart” and with the help of artificial intelligence or machine learning, they are able to connect with all other smart devices. And with the help of a simple app on your smartphone, you can control everything in your home — your fridge, TV, AC, the lock on your door, your kitchen appliances, you name it — from any remote location. The applications of this in your personal life are enormous, but in public life IoT can be helpful in improving the life of the population in particularly three areas, as the pressure on urban infrastructure is increasing day by day with the continuous influx of rural migrants. Smart water meters can help detect water leakage and wastage, and even control consumption efficiently. They can also save and earn municipalities revenue which they can divert to other infrastructural projects. Increase in urban population means more traffic congestion, which is only going to get worse, with more people coming into cities and more vehicles being sold. Smart traffic signals can be a viable answer to this problem. They can control traffic efficiently and not only keep the traffic moving smoothly but also prevent accidents. Public transportation goes into a tailspin whenever there are road blocks, bad weather, or accidents. IoT can give the transport authorities real-time insights into the traffic situation and help them implement contingency plans. This will ensure that people have access to safe, dependable and efficient public transportation.